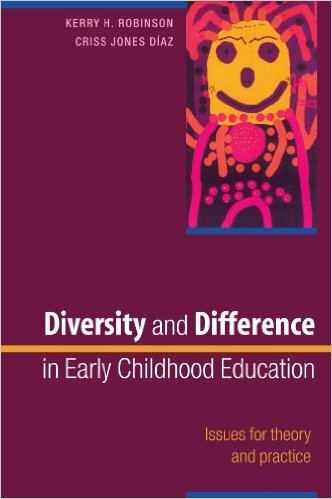 Diversity and difference in early childhood education: Issues for theory and practice, written by Kerry H. Robinson and Criss Jones Diaz (2005), increases the theoretical understandings of early childhood education and development in relation to diversity, difference, and social justice. The book is focused on how best to approach early childhood education from various perspectives, including post-structuralism and feminist perspectives. Each chapter translates theory into practice, and explores how to create the most equitable environment for all students, regardless of circumstance or difference. 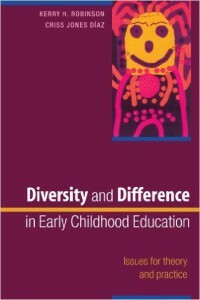 Although the book is focused in general on diversity and difference in early childhood education in Australia (such as discussing racism and heterosexism), there is a heavy focus on refugee students, asylum seekers, racism, and immigration issues, across the world, as well.